India's budget airline SpiceJet, today announces the launch of its HAPPY NEW YEAR SALE of domestic air tickets, ushering in the cheer and celebrations of end of the year 2015 and onset of the new year 2016. 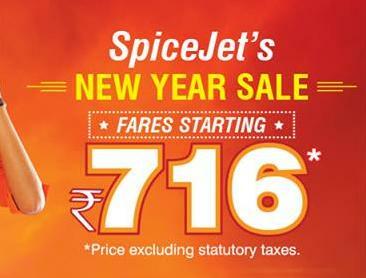 As a part of this sale, SpiceJet one-way base fares start at Rs. 716/- (excluding taxes) for some very popular domestic routes. The four-day sale starts today (28th December 2015) will be open till midnight, December 31, 2015. The travel period covered in this sale is from 15th Jan 2016 to 12th April 2016. It is valid only for travel on direct flights on SpiceJet's domestic network. This is a great oportunity for routine flyers to avail these very attractive fares to plan their domestic travel well in advance.